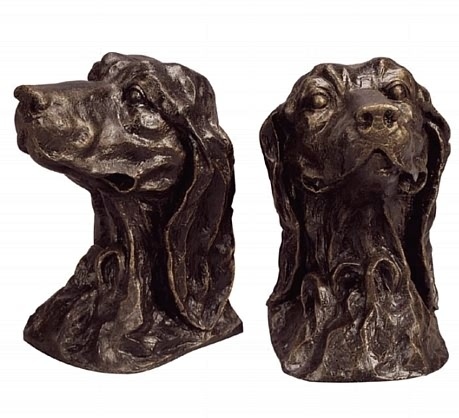 Our cast iron bookends featuring America's popular and faithful dog is lovingly crafted in the form of this set of Golden Retriever bookends. The set of bookends are beautifully detailed and expressionistic. Made of cast iron. Hand finished. Dimensions: 12.5W x 8.5" x 6.5"
Golden Retrievers are known to be family dogs. They cannot live without people around them. In fact, it is said the dog can get bored and irritable without company. Hence, having such a dog means that you are prepared to give a lot of your time to it. Since they love children, you are completely safe with the Golden Retriever. Although they may tend to be boisterous, Golden Retrievers love children. However, exercise care with a small child as the dogs are notably strong and can knock down a small child.